Researchers at the U.S. Naval Research Laboratory (NRL) think their weather prediction model, Coupled Ocean/Atmosphere Mesoscale Prediction System for Tropical Cyclones (COAMPS-TC), tracked 2017's Gulf of Mexico storms better than ever. Used by the National Hurricane Center (NHC), a component of the National Oceanic and Atmospheric Administration (NOAA), COAMPS-TC is updated annually before hurricane season with new innovations to improve TC modeling and predictions. "In a 72-hour timeframe COAMPS-TC has a significantly low tracking error average of about 100 nautical miles and an intensity error of only 17 knots," said James Doyle, a research meteorologist at NRL-Monterey (NRL-MRY). 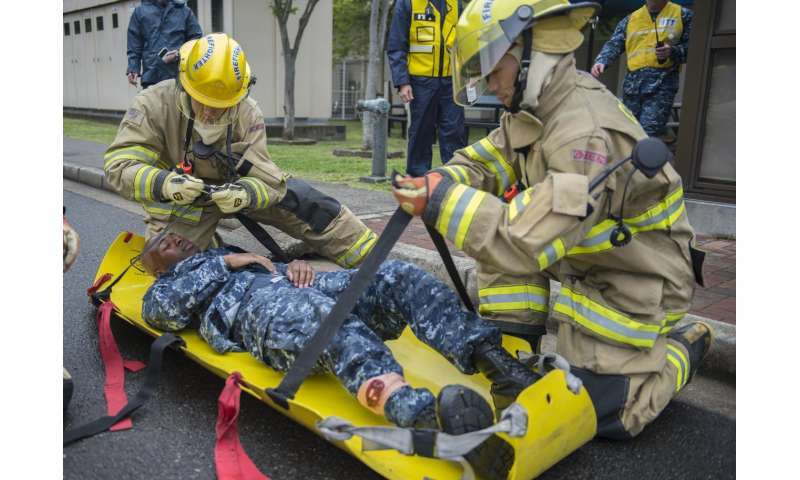 "COAMPS-TC improves forecasts and evacuation correctness in both the Pacific and Atlantic oceans and enhances the safety of U.S. Navy ships, aircraft, and the civilian population." At 617,800 square miles, the entire Gulf of Mexico in proportion to Hurricane Harvey's size, 200 miles in diameter, a tracking error of 100 nautical miles is significantly accurate, according to Doyle. "We've found this year's version of COAMPS-TC to be most skillful in our area of responsibility, eastern North Pacific and North Atlantic basin," said Dr. Michael Brennan, Branch Chief in the Hurricane Specialist Unit at NHC. "This variety of COAMPS-TC is included in the multi-model consensus aids for track and intensity that we create at NHC to blend together our best available model guidance." In addition to forecasting tropical cyclone activity for the Navy and Marine Corps around the world, having accurate forecasts is also important in the Defense Department's mission in supporting civil authorities. "It is critical for citizens to have faith in their institutions to provide accurate information for their safety and livelihood," said Baton Rouge Mayor Sharon Weston Broome. "Providing a stronger predictive model of the path and intensity of a storm or hurricane will hopefully reinforce the need for citizens to heed evacuations advisories." Improvements to this numerical weather prediction model gives state agencies and local weather outlets more time to deliver data-backed orders to evacuate. "The difference between Category 1 and 2 hurricanes on the Saffir/Simpson scale is about 15 knots," said Doyle. "So even though COAMPS-TC's 17 knot intensity error is noteworthy we still seek to enhance its capabilities." These upgrades also give NRL the opportunity to continue and foster collaboration with relevant weather predicting institutes along the Gulf Coast. Louisiana State University has expressed interest to partner with NRL in future endeavors. "LSU hopes to partner with NRL in future endeavors to assess improvements in model performance, which could help to enhance storm preparation and evacuation along the Gulf," said Dr. Robert Rohli, professor at Louisiana State University College of the Coasts and Environment. COAMPS-TC—a numerical weather prediction model—uses computer programs and supercomputers to predict the track, structure and intensity of tropical cyclones (TC) around the world, using layers of historic and current environmental data.